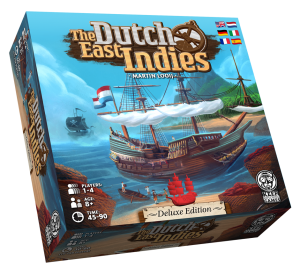 Keep Exploring Games goes back to the 18th century, to release The Dutch East Indies to the world! In The Dutch East Indies, you are a captain and you have two ships, and a clear mission. Collect desired spices, and do so before any other country can! Now, you could just use the trading goods from your own country and try to trade the spices with locals. Or maybe you find it more satisfactory to simply fire away at your competitors and try to steal the spices they collected! Upgrade your ships to get faster, stronger, or be able to carry more goods at a time. And beware of pirates, who do not care about spices but do care about sending your ships to the bottom of the sea! Whoever collects the 8 desired spices the fastest wins! The Dutch East Indies will be available in a Standard Edition with cardboard components and a Deluxe Edition with metal coins, 3D plastic miniature ships and crates and wooden spices. The Dutch East Indies released at Essen 2017 and is now for sale on our website and through distributors and stores.